RoboSalmon, an underwater robot meant to spy on the real fish, is being developed at Glasgow University. RoboSalmon has a built-in camera to broadcast images of real fish back to the operators of the device. Zoologists will use RoboSalmon to monitor various fish species in their natural habitat. A key feature of RoboSalmon is its propulsion system. Since the robot will use its fins and tail for movement, it will be able to move through the water in a way that is more natural for aquatic creatures. 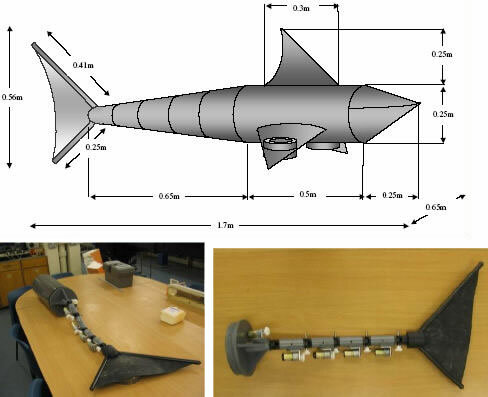 Propellers make an unnatural noise that disturbs fish; RoboSalmon's biomimetic characteristics should help it blend in. Robot evolution (biomimetic or not) does not follow the course of natural evolution. It turns out the the RoboSalmon is a direct descendant of the SHARC - Submersible Hybrid Autonomous Rover Craft. 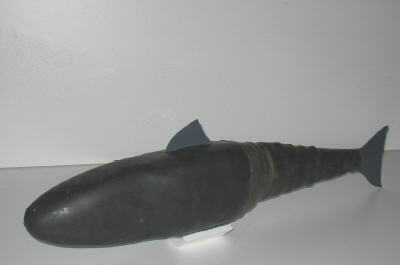 The SHARC was also designed as a biomimetic system, using its tail to move around. Via a very skimpy article here.